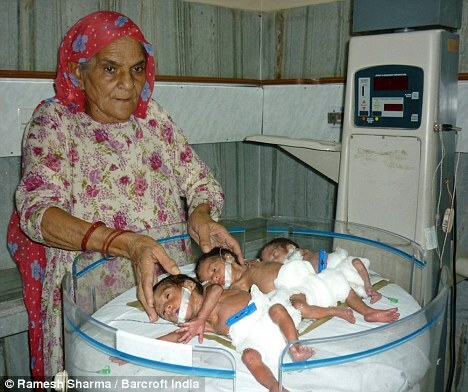 A childless Indian woman has become the oldest person in the world to have triplets – at the unbelievable age of 66. Bhateri Devi and her husband Deva Singh, 64, are celebrating their arrival of their first, second and third babies nearly 44 years after getting married. 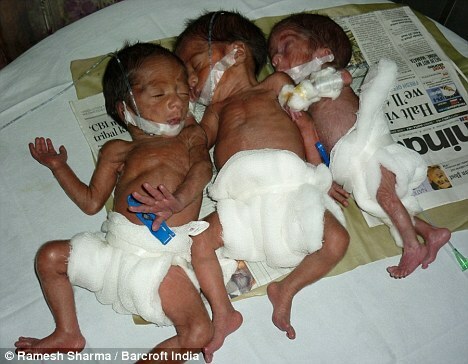 The three tiny preemies, 2 boys and a girl, were born after Bhateri had IVF treatment at the controversial National Fertility Centre in northern India. It is here that the world’s oldest mother, 70-year-old Rajo Devi Lohan, was also treated. “Bhateri has fulfilled my dream of having a child and giving my family an heir. She was my first wife and after she failed to conceive a child, I married twice but again. I did not have any child from my other wives also. Sadly, the babies, who were born on May 29, arrived weighing just 2lb 6oz, 2lb 4oz and 1lb 7oz and will need an extensive amount of care to survive. Not to mention loads of money to keep them fed and clothed. Having kids is not about pride, it’s about nourishment and enrichment. It’s about enjoying life with them and then watching them do the same with their children.